Perfectly co-ordinated, just for you!. Rods and Blinds is proud to bring you this quality fabric range that has been color matched by Resene to make it easy to bring together your interior paint colors and co-ordinate with your window blinds, giving that finishing touch. Our Resene Origin range is thermal backed for added insulation and comes with a full five year warranty. Resene Origin has also colour matched the back of the fabric to match the front making it suitable for both front and back roll. Did you know that Rods and Blinds has been selling tens of thousands of blinds online from Queenstown to Auckland since 2008. Cleaning Instructions: Dust regularly and remove marks by sponging gently with mild detergent in luke warm water. If commercial spot cleaners are used, they must first be tested and allowed to dry on an inconspicuous area to ensure compatability. How do I measure for blinds? We require all measurements in millimetres to the nearest millimetre to ensure the best possible fit. When measuring your window be sure to take into account the position of handles, air vents and tiles if necessary which may obstruct fitting and function of the blind, this will ensure the location and fitting of the blind is perfect. All our blinds are simple to fit and can all be face fixed into the wall or window frame, or top fixed into the lintel, giving you complete control over the fixing position. You will also need to note down which side of the blind the controls are to be located. Remember to always double check you measurements!! This term is used when you want your blind to be fitted on the outside of your window recess, your blind will then be made exactly to these measurements. This measurement is used when your blind is to be fitted inside the window recess; you haven't got to make any deductions as we will then make your blind so it fits perfectly into the window. NOTE:There will be a small gap each side of the blind fabric to allow for the brackets and sidewinder to fit inside the frame. Use these step by step Instructions if you want you the blind to hang on the outside of the window recess. Step 1 - Start by measuring the exact width you want the blind fabric to cover as shown and note down this measurement (see fig 1). Step 2 - Now measure the exact drop of the blind from the top where it is to be fitted and measure the required length you want the blind drop to be then note this measurement down. You now have the two measurements you require to choose any blind type from in our range. Check that the window sill projection isn't going to obstruct the function of your blind. NOTE: Your brackets will go beyond this measurement again. IMPORTANT! Should you wish your blind to fit outside the frame but within a restricted space which will then include the fixtures you must then put inside frame fit. HELPFUL NOTES: Remember when you give us the exact blind fabric width that you require, the brackets will come out an extra 17 mm on each side of the blind. Use these step by step instructions if you want the blind inside the window recess. Step 1 - First measure the window recess from wall to wall or width in three places as shown (please measure where the actual blind is to fitted or located). Note down the shortest width measurement this is the measurement we need (see fig 2). Step 2 - Then measure the drop of the window recess from the top down to the sill in three places, again note the shortest drop measurement this is the measurement we need. Now you have the two measurements you require you can choose any type blind from our comprehensive range. Which way should my blinds roll? There are two ways your roller blinds may roll - either front roll or back roll. This is where the fabric rolls off the front of the blind. This is the usual way a blind will roll when it is fitted inside the frame. We recommend this way for nearly all applications - especially if your window has aluminium window joinery. This is where the blind rolls off the back of the blind. This is the usual way a blind will roll when it is exact or fitted on the outside of the frame. My window is wider than the maximum width? This is quite a common problem. Your window will require two blinds. Please contact us or phone us on 0800 763 748 so we can discuss the best options with you. We usually take between seven to twelve working days to process orders for sunscreen blinds, blackout roller blinds, venetian blinds, curtain rods and tracks and ready made curtains. If there is a delay ,you will be notified at time of placing your order. If you require your order by a certain date, please let us know and we will do our best to meet your deadline. 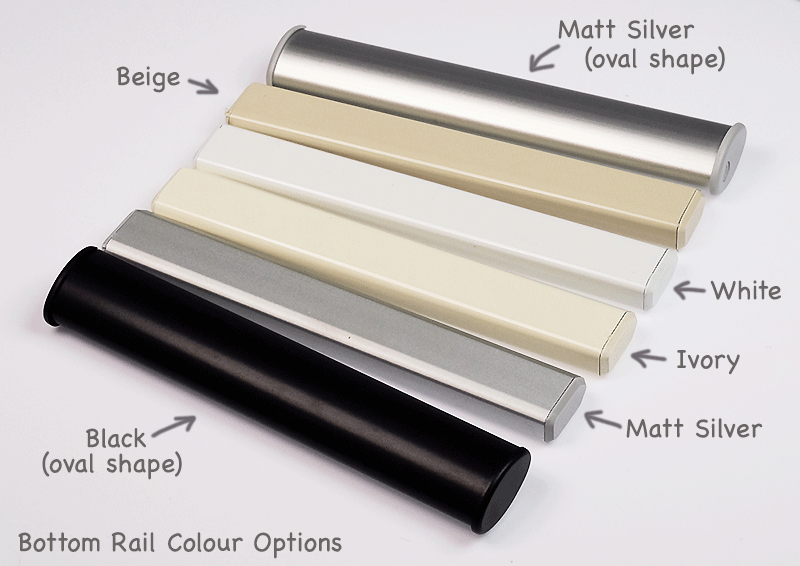 On our Easy-Fit curtain track range , we have same day dispatch on your order. As long as we receive your order by 1pm it will be dispathed that day . Delivery is usually the next day for most North Island customers and three days for most of the South Island. Our three day dispatch blinds will be sent within three working days. We accept Visa, MasterCard, direct credit and cheques. What are the freight costs if my order is below the FREE freight amount? Blinds. No minimum value - FREE freight nationwide. FREE DELIVERY to the North Island on all orders above $500.00 and Free Delivery to the South Island on all orders above $800.00. If you have a Rural Delivery (RD) address then a rural delivery surcharge will apply. Curtains. No minimum value - FREE freight nationwide. What is three day dispatch? Three day dispatch means that this particular item will be dispatched within three full working days of receiving your payment. Orders that consist of both three day dispatch and standard delivery products will all be processed at the standard delivery times. Thanks Rodsandblinds for an amazing service. I LOVE my new blinds. Super easy and super efficient service all round. We absolutely love our roller blinds we have purchased for our kitchen/lounge area. Very quick and simple to install, fast turnaround and great customer service. Will be ordering more for our bedrooms. Have ordered two separate lots of sunscreen blinds and very happy with the service - easy to order and good communication. Blinds were very easy to install too. Really delighted with blinds and the service was excellent.Highly recommend you to all my friends.